This post is in response to a question asked on Ask Ives. Water consumption is definitely an extremely part of anyone’s day, however, individual consumption volumes varies from person to person. A great resource on this subject can be found here, but for more summarized details, keep reading! The benefits of water consumption are immense – water is the lubricant of our bodies! Water also does a great job flushing out toxins that may be present as well within our vital organs, brings nutrients to our cells and provides a moist environment for important tissues. 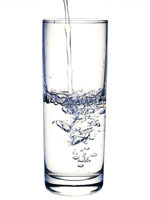 The intake on a daily basis for Men in a temperate climate is roughly ~3 liters (13 cups). Women is a little less, coming in at ~2.2 liters (9 cups). We’re sure you’ve all heard the 8 cups of water a day rule, which can be shown to be roughly correct when comparing to the values given above. Is there a way to train yourself to lower your heart rate? This post is in response to a question as asked on Yahoo! Answers. Training your body and ultimately participating in physical exercise will over time lower your heart rate. Average Heart Rate information is available through the main Average Body website, and varies quite dramatically by gender as well as age. This great resource offers a lot of good information on the subject, though tends to get quite technical. As such, we will attempt to do here at The Average Body what we do best - Summarize! In a watered-down sense, physical activity excites a number of neural and chemical components within the Human Body. This excitement leads to an increased activity within some of your nerves, namely the nerves that are 80% responsible for the slowing of your Heart Rate. The increased exposure to exercise eventually serves to slow the resting and ambient Heart Rates. Welcome to TheAverageBody.com’s official Blog! We thought this would be the best way to reach you, the readers, regarding all the quirky (and not so quirky) things to do with the Human Body.